Like Roy from the IT Crowd, we’ve seen this script before. An intractable political dispute that is only resolved by a hard reboot to the political system. Whether it be the 1994 government shutdown, the economically costly 2011 dalliance with default, or the fiscal cliff, it seems that only through self-inflicted trauma can politicians muster the will to perform even the most basic of legislative tasks. 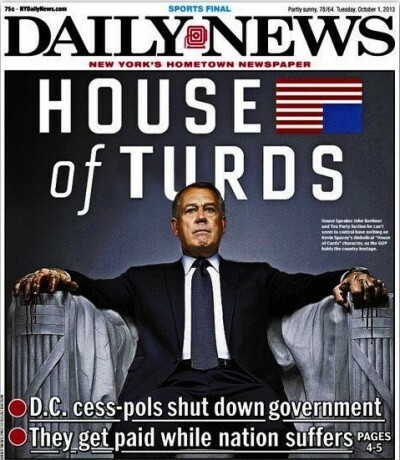 The 17-day shutdown of the United States federal government in October was the most dramatic manifestation of a series of intermittent on-again, off-again governance crises that have popped up since the GOP takeover of the U.S. House in 2011. After each crisis, the political system is jump-started and muddles onward to the brink of the next shutdown or debt default. We can, no doubt, look forward to more political skirmishing in 2014. In October, the policy logjam and political grandstanding brought the federal government (temporarily) to a screeching halt. Yet the political saga birthed a flurry of memes, hashtags, and viral videos. The humorous imagery, witty commentary, and politicized remixes of reoccurring memetic images convey more than just a good joke. When taken in context, they are useful tools for explaining the key personalities, ideologies, events, and consequences of the budget crisis and the government shutdown. The failure of Congress to agree to the terms of a continuing resolution to fund the federal government forced the shuttering of non-essential government operations on October 1. 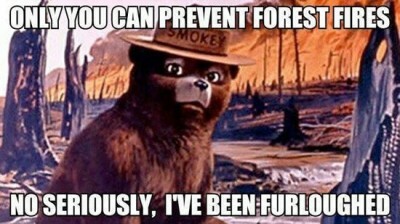 A wide variety of federal agencies (FEMA, NASA, NOAA, and the IRS, to name a few) mostly closed shop and hundreds of thousands of government workers were furloughed. Many impacts were behind the scenes, but one of the most visible and, for many, unbearable consequences of the shutdown was closure of all of the national parks. 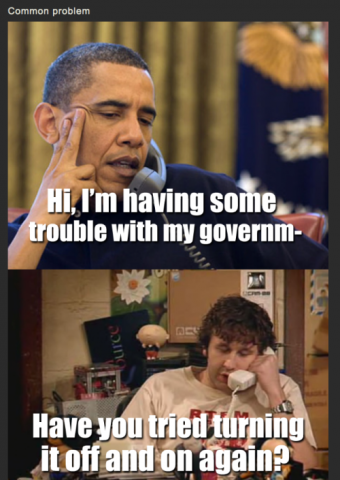 Another consequence of the #governmentshutdown was that all federal government websites went dark, including critical (non-critical) websites for programs like Amber Alert, the Federal Elections Commission, and consumer protection agencies. Hitting hardest, perhaps, for cute critter-obsessed web users, #pandacam had also gone dark. 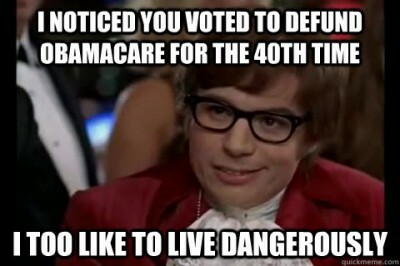 #DearCongress: How Did This All Happen? 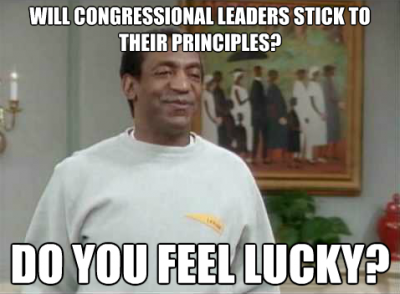 One of the perils of a Presidential system (and, even worse, a bicameral one!) is that it creates competing claims for democratic legitimacy that have no way of being resolved if the various branches of government refuse to agree. At the root of the intractable budget crisis is the reality that there are presently three factions vying for control of government policy-making: Democrats, led by President Barack Obama, and including the Senate majority and a fairly united House minority; an expanding Tea Party faction, now led by by Republican Texas Senator Ted Cruz (R-TX), featuring widespread support by rank-and-file House members; and a shrinking cadre of establishment Republicans, led by the GOP leadership and including a majority of Republican senators. President Obama’s governing style tends to be slow and steady and has been called somewhat aloof, an approach that emboldens opponents and causes much anxiety for supporters. Obama borrows from Mohammed Ali’s “rope-a-dope” strategy, letting Republicans take a few hits, waiting for them to swing too far. 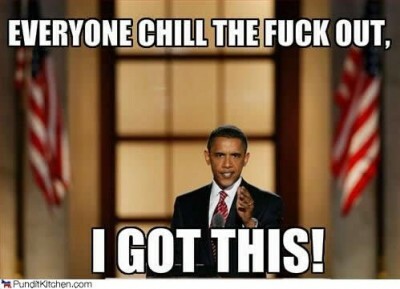 The classic Obama “I Got This” meme, which originally surfaced during the 2012 election is a prescient reminder to nervous Democrats and overconfident Republicans that although Obama may get roughed up by the opposition, he usually emerges with the upper hand. Obama’s resilience has been likened by many pundits and political cartoonists to the Roadrunner, perpetually escaping the antics of Wile E. Coyote Republicans, whose schemes tend to blow up in their faces and/or drive them off of cliffs (fiscal or otherwise). Fueled by the Tea Party Protest movement, scores of ideological conservatives have been elected to the U.S. House and have shown themselves to be less interested in the responsibilities of running government than with aggressively undermining Obama’s policies and dismantling the federal bureaucracy. 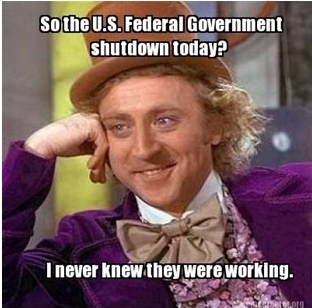 Thus, when the government shut down, the general Tea Party reaction was similar to Condescending Wonka’s: indifference. To Tea Party conservatives, the federal government is inherently and irreparably broken. While showing indifferent to a government shutdown, the Tea Party’s rhetoric on matters such as Obamacare and the President’s policies tended towards the apocalyptic, justifying dramatic political tactics, explosive confrontation, and the use of any leverage—even the threat of default on U.S. debt—to achieve their goals. The emergent leader of the Tea Party faction is freshman Texas Senator Ted Cruz. Known for his political showmanship, including a lengthy filibuster, he has gained an outsized influence over a reactionary band of House Republicans who were pivotal to precipitating the shutdown. Sen. Cruz has become the darling of the Tea Party and the bête noire of Democrats. One apt (but oh so inappropriate!) meme was the Miley Cyrus-inspired mash-up of Sen. Cruz swinging through the capital building to the tune of “Wrecking Ball.” On a similar theme, a viral SNL parody featured Cyrus playing Tea Party Congresswoman Michelle Bachmann (R-MN). Mirroring the bad girl pop singer, even as the vast majority of Americans are revolted by its destructive and distasteful activities, the Tea Party carries on, unconcerned by the disapproval of the majority of Americans. As the opposition leaders in control of the House and a filibuster-prone Senate minority, the establishment-backed Republican congressional leaders—not aliens or the Tea Party—are ultimately responsible for the decision to delay passage of legislation required for operation of the federal government. Even though there were sufficient votes in the House to pass a “clean” continuing resolution and to avert a government shutdown, Speaker Boehner insisted on passing bills with only GOP votes that would inevitably be rejected by the Senate and the President until the very last minute. 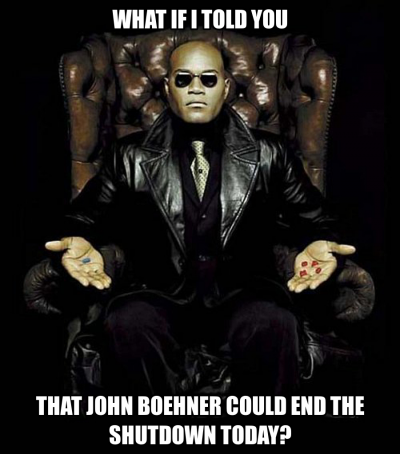 Having helped fan the flames of the Tea Party in order to wrest control of the House in 2010, House Speaker John Boehner (R-OH) knew that he, too, would get burned if he did not toe the Tea Party line on the budget. 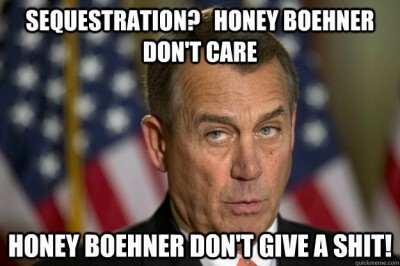 Nonetheless, the unabashedly conservative House Speaker has still been subject to ample Tea Party scorn, some of which has been collected by the Tea Party Insult Generator, which spews out insults that had been posted on Speaker Boehner’s Facebook page. With various members of congress on seemingly different planets from each other—not to mention from the President, perhaps Captain Kirk best channels the wrath of the American people. The roots of the October 2013 shutdown crisis go back to April 2011 when the newly elected GOP House leadership and President Obama negotiated a budget deal that featured a purported $38 billion in cuts. The cuts turned out to be primarily accounting gimmicks designed to give Republicans something to brag about without causing any significant pain to those who depend on government spending. The conservative bloc in the House, however, was outraged by the deal and felt that the deal sacrificed its core principles. In August 2011, when the debt ceiling needed to be raised, Republicans saw an opportunity to exert meaningful leverage on Democrats. Under threat by the GOP to force a default on the national debt, a deal was brokered to create a “super committee” and construct a “fiscal cliff” (that would conveniently occur just after the November 2012 elections), at which time automatic tax increases and draconian budget cuts, known as the sequester, would go into effect. 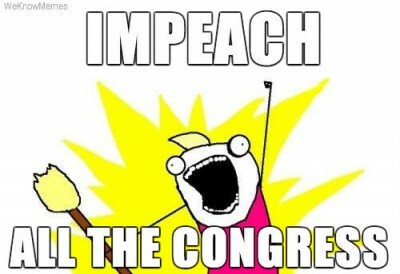 After President Obama’s reelection, Congress agreed to climb halfway down the fiscal cliff by reaching a deal on taxes. However, the budget side of the ledger remained unresolved. Speaker Boehner seemed to be taking a more conciliatory approach, even acknowledging that “Obamacare is the law of the land.” He quashed an attempted coup by conservative House members and the Republican House leadership decided at the GOP Retreat on January 18, 2013, to postpone efforts to confront Obama on budget issues and the debt ceiling until later in the year. Some conservative activists saw Speaker Boehner’s willingness to allow passage of another agreement with President Obama as capitulation, and there was a growing desire to intensify the confrontation when the matters would be taken up again. Meanwhile, the across-the-board cuts known as the federal budget sequestration went into effect on March 1, 2013. 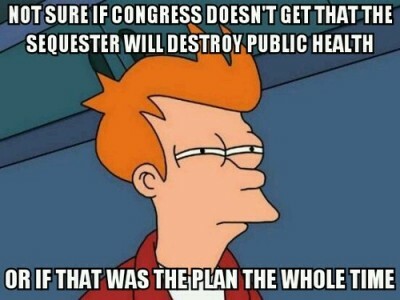 The sequestration cuts had been designed to be so unpalatable that all sides would reach an agreement to avert them. 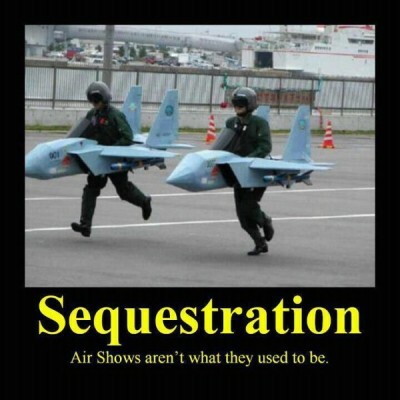 The sequestration affected programs from the military (resulting in cancellation of air shows, civilian employee furloughs, and cuts in military procurement) as well as to public health and scientific research. Seeing their approach on sequestration as an unalloyed victory, Republicans and especially Tea Party Republicans were emboldened to push further against Democrats. Outraged by the tactics employed by Republicans, Democrats were determined not to lose out again to Republican hostage-taking. In August, Sen. Cruz met with leaders of the Republican Study Committee (RSC), the growing conservative House caucus that now boasts 174 members. Rolling Stone reports that Sen. Cruz told the group: “As scary as a shutdown fight is, if we don’t stand and defund Obamacare now, we never will.” Spurred on by the Senator, 80 House conservatives delivered a letter to Speaker Boehner demanding that the House “affirmatively de-fund the implementation and enforcement of Obamacare in any relevant appropriations bill brought to the House floor.” While the House has voted to defund and repeal Obamacare 46 times, the Democratic-controlled Senate has ignored those bills. By linking the cause to the funding of the rest of the government, conservatives hoped to gain leverage. As the deadline to pass a funding bill for the federal government loomed near, Speaker Boehner complied with the wishes of his Tea Party caucus members, passing continuing resolutions that contained various Obamacare-related poison pills that would inevitably fail in the Senate. This strategy set up the government for shutdown and was roundly criticized by some of the more experienced Republican legislators, such as Sen. John McCain (R-AZ), Rep. Peter King (R-NY), and Rep. Devin Nunes (R-CA), for example. Having already established that he would only allow a “clean” funding bill to pass the Senate, Sen. Reid took up the House-passed bill and stripped out extraneous amendments pertaining to Obamacare. 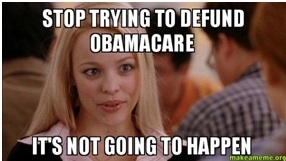 But before the vote, Sen. Reid agreed to allow Sen. Cruz to stage a 21-hour faux-libuster of the bill. The dramatic talkathon, while procedurally meaningless, proved a rallying cry for conservatives on the eve of the government shutdown, spawning some of the most popular conservative shutdown hashtags: #standwithcruz, #standwithted, and #MakeDCListen. The colorful speech also made fantastic Twitter fodder for liberals. Memorable hightlights include wacky quotes such as “The Moon might be as intimidating as Obamacare” and a full reading of Dr. Seuss’ Green Eggs and Ham, presumably showing Sen. Cruz’s Sam-I-Am level distaste for Obamacare. 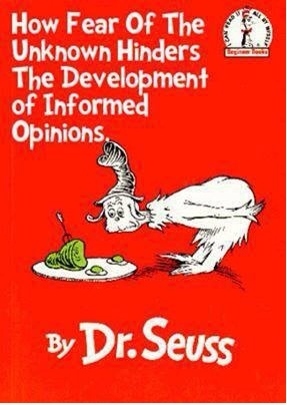 Nevermind that the Seussian metaphor breaks down because, in the end, even Sam agrees that the much maligned green eggs and ham are surprisingly tasty. Not exactly the message Senator Cruz intends to convey. After Sen. Cruz was done talking, the Senate passed its government funding bill, but the House refused to take up the funding bill because of continued conservative opposition, even though a majority in the lower chamber—Democrats and mainstream Republicans were willing to pass the legislation. 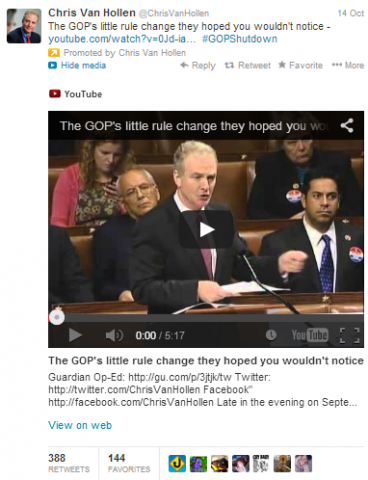 In fact, as Rep. Chris Van Hollen (D-MD) pointed out in a floor speech that went viral on youtube and has garnered nearly 3.5 million youtube views, that the Republicans changed the rules of the House (which normally allow members to call for a vote on senate-passed bills) in order to prevent a clean government funding bill from coming to a vote. With the Tea Party-influenced House and the U.S. Senate at an impasse, the federal government shut down on October 1, 2013. 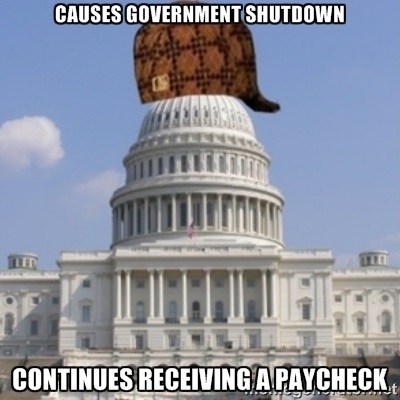 While many government services were stopped and thousands of employees were furloughed, Congress continued to get paid. While a number of members refused pay, a few had a different response when asked if they would keep their pay. “Dang straight!’ was how Rep. Lee Terry (R-NE) originally responded, reports the Omaha World Herald, when asked if he would keep his pay. “I’ve got a nice house and a kid in college, and I’ll tell you we cannot handle it. Giving our paycheck away when you still worked and earned it? That’s just not going to fly.” Of course, that response from Congress didn’t fly with many Americans. 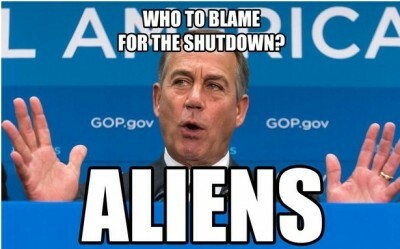 With the growing political nightmare that was the government shutdown, congressional Republicans, who instigated the crisis went into spin mode to try to divert the blame onto President Obama in the hopes that he would accede to some of their demands or allow them a minor policy concession so as to save face. 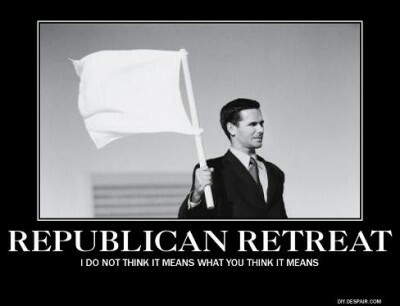 After months of refusing to negotiate with the Democratic-controlled Senate, the GOP now blamed Obama for the shutdown because of his refusal to negotiate with them over the various extraneous measures that Tea Party Republicans wanted included in a continuing budget resolution. 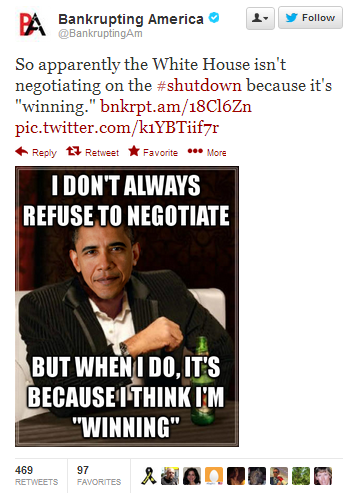 Obama and Democrats didn’t see the GOP demands as negotiation—they saw them as hostage-taking. Obama now took a much harder line than he had in previous negotiations, establishing a principled opposition to exchanging any concessions to Republicans for passage of a funding bill and debt limit increase. To reopen the federal government and extend the debt ceiling, Obama stated the same offer that Michael Corleone had offered corrupt Senator Pat Geary in Godfather II: “nothing.” Democrats relished the President’s newly emboldened negotiation tactics. To counter the Democrats’ intransigence, Republicans turned to the playbook that they had used to successfully handle the sequester. They sought to pass piecemeal funding bills to reopen the parts of the government that Republicans most cared about and that were most visible to the public—National Parks, the District of Columbia, and the Department of Veterans Affairs. When Democrats voted against the piecemeal measures, demanding a comprehensive funding package, the GOP attacked Democrats for voting against funding those agencies and sought to place the blame for the shutdown of those popular government services on Democrats. Republicans staged protests in front of the World War II Memorial and the party developed a number of (largely unremarkable) memes to dramatize the alleged refusal of Democrats to open national parks. Republicans went so far as to suggest that by shutting down the national monuments because of the failure to pass a budget, the executive branch was playing games and was costing taxpayers money. A viral video taken by NBC Washington shows Rep. Randy Neugebauer (R-TX) scolding a park ranger for guarding the closed World War II Memorial: “The park service should be ashamed of itself.” Democrats online came to the rangers defense, sharing the opinion of a bystander, who countered the congressman’s spin. Ultimately, the resolution to the shutdown battle was linked to the debt ceiling, which needed to be raised by October 17 to avoid a calamitous default. 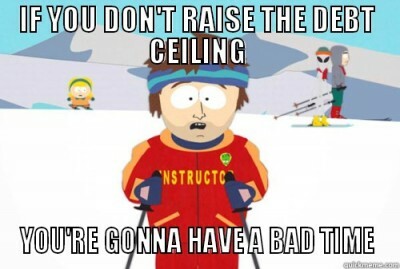 Republicans had hoped to use the debt ceiling as leverage to force Democrats to make concessions (as they had successfully done in the summer of 2011). This time, however, the looming debt ceiling forced establishment Republicans to abandon the Tea Party and largely agree to the proposals pushed by Democrats. While publicly chiding Democrats for their refusal to negotiate, many senate Republicans were working with Senate Majority Leader Harry Reid to ensure passage of a bill to fund the government and increase the debt ceiling. Meanwhile, Senator Ted Cruz was determined to continue the fight, rallying his tea party supporters in the House at a secret meeting at a Washington, D.C., restaurant on October 15. Bowing to the pressure from the conservative bloc, Speaker Boehner scuttled the Senate negotiations and insisted that the House would pass a bill that would represent a final offer on the budget and debt ceiling (even though with Democratic support in the House there would have been plenty of votes to pass the Senate bill). Determined to pass a bill with majority support among House Republicans, Boehner sought to induce conservative support for a budget bill by including a proposal that would strip employer health care subsidies from members of Congress and their staff. 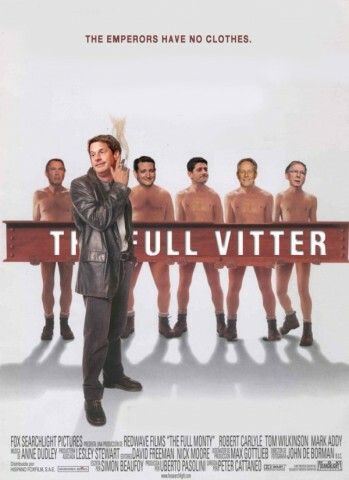 The plan, known as the #FullVitter, referencing an extreme version of the amendment originally proposed by fun-loving Louisiana Senator David Vitter (R-LA), was not sufficient to allay tea partiers who wanted to go further and was unpopular with moderate Republicans, Democrats, and of course ALL congressional staffers, who would be most affected by the amendment. After insisting on a House-generated compromise bill, Speaker Boehner, embarrassingly, was unable to craft legislation that would have sufficient votes to pass even the GOP-controlled the House without Democratic support. 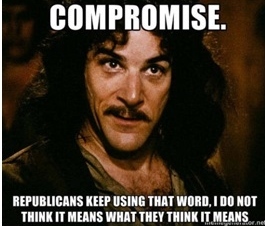 Thus, the ball was passed back to the Senate where Sen. Reid and Sen. McConnell were able to hammer together a “compromise” bill (which contained only nominal concessions by Democrats). With the government reopened and default averted, Republicans in Congress gained nothing except for extreme unpopularity. An October Washington Post-ABC poll, taken right after the shutdown, found that only 12 percent approved of Congress. Meanwhile, a USA Today/Survey Research Poll found that only 4% of Americans thought that replacing every member of Congress would make it worse. The shutdown fight also served to embolden the Tea Party faction and to raise the profile of Senator Ted Cruz, a possible Presidential candidate, who, likely, would not stand a chance against the presumptive Democratic nominee in the 2016 Presidential election.